Lenses designed for 35mm Motion Picture format will "crop" or become more telephoto when used on the smaller imagers found in digital cameras. Because of this, every digital format has a specific crop factor that you can use to find an equivalent 35mm format lens size. By taking the lens focal length of your format and multiplying it by the crop factor, you can determine a 35mm format lens that will produce the same Field of View (FoV). You can also use these crop factors to find equivalent lenses across various formats. To those transitioning to digital this info is useful in figuring out what size lens on HD cameras is going to correspond to what you already know from shooting on 35 and Super 16. Currently the 3 most commonly used sizes in digital camcorders are 1/3", 1/2", and 2/3" available in both 3CCD or 3CMOS versions. Each of these sensors require different size optics to deliver the same relative Field of View (FoV) and Depth of Field (DoF). If as a cinematographer you know exactly what a 28mm lens is going to look like when you put it on your Super 35 camera then wouldn't it be nice to know what lens you need to put on your 2/3" HD camera to get the same Field of View? Let's figure it out. Based off of crop factor of x2.5 for 2/3" HD, we can divide 28mm by 2.5 which gives us an equivalent lens of 11mm for the smaller format. The above illustration shows a lens image circle created by an 85mm lens. Lens make circular images, not rectangular ones. They are matted down to a rectangle when they pass through the gate and onto the film plane. 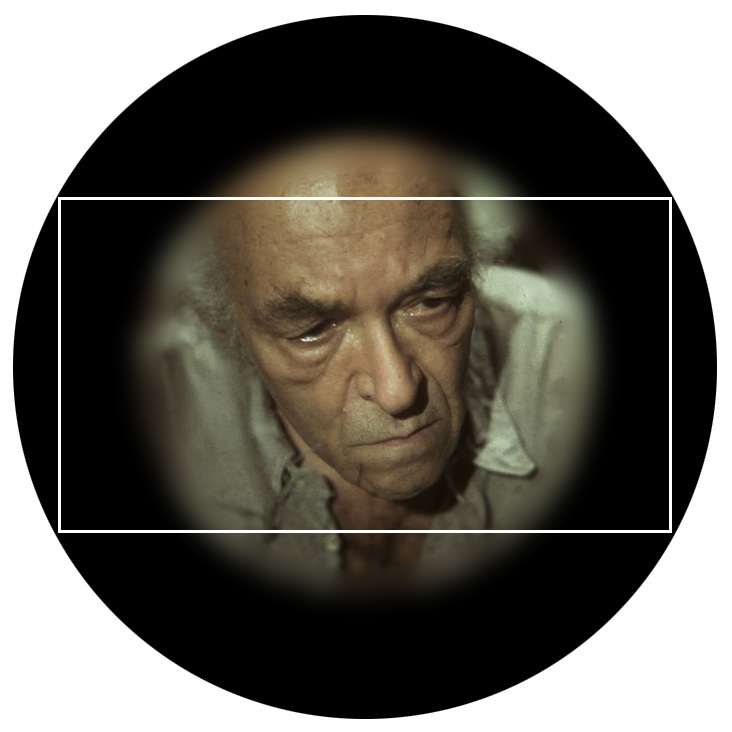 As you can see, a lens designed for 35mm cinematography is optimized to create the largest possible field of view on 35mm motion picture film. The frame extends as close to the edge of the circle as it can before vignetting becomes apparent. 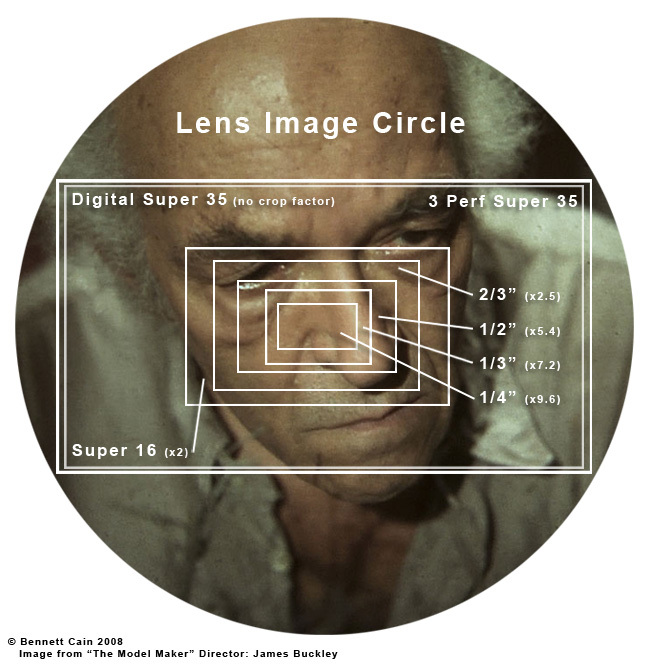 The same size lens when used with a smaller imager does not perform the same way because it does not have the physical area to cover the image circle the same way Super 35 does. Additionally a too large image circle when used on a smaller imager may let in unwanted light which reflects off the sensor and causes flare. Many people think that 35mm format lenses behave more telephoto when used on smaller sensor digital cameras. In fact they do but what is actually happening is by the default of its own size, the chip is just cropping in on the available image. So for example, if you put 25mm lens on a 1/3" camera, because of the 7.2 crop factor, that 25mm lens will behave more like a 180mm would on a 35mm film camera. Reading the various online forums and books on optics, I've found there is a great deal of confusion as to what constitutes a "normal" lens. First of all, what do camera people mean by normal? By all accounts, a normal lens is one that is neither wide nor telephoto. In other words, one that approximates "normal" human perspective and field of view without creating unnatural distortion. In HD video, the exact same lens will create a totally different image depending on the size of your camcorder's sensor. So how do how do you figure out how to create a "normal" Field of View for whatever format you're shooting? In the world of 35mm still photography, a 50mm lens is considered to be a good choice for reproducing the human field of vision. The renowned French photographer, Henri Cartier-Bresson, shot his entire career on a 50mm lens for this reason. This is because a 50mm is quite close to the diagonal measurement of the film plane in 135 format (aka 35mm still) which is 43mm. To create a natural, undistorted perspective in photographic images you must first determine the diagonal measurement of the film plane or image sensor and then match the lens accordingly. A smaller size (mm) than this diagonal will result in a wider image and a larger will result in a more telephoto image. 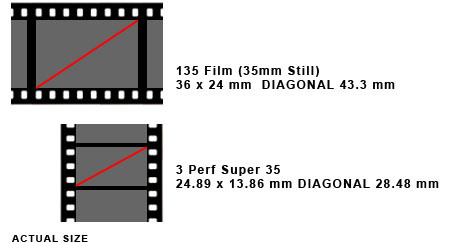 If this is the case then what is a normal lens for Super 35? According to the rule of the diagonal; to capture a perspective that is undistorted for this format you would use around a 28 or 30mm because the diagonal measurement of the negative is 28.48mm. This seems a hair wide to me though so I would err on the side of a 35mm as a normal perspective lens for this format. As far as finding a normal lens for your HD camera goes, it's a little bit more nebulous than for film cameras. Because each camera uses different dimensions of active pixels and pixel aspect ratios as well as pixel sub-sampling and host of other specific factors, determining a precise "diagonal" can be challenging. The actual active size of 2/3" 3CCD sensors can be wildly different from manufacturer to manufacturer so there is no way of systematizing this at the moment. That being the case, many shooters just use the crop factor formulas to arrive in the ballpark of what they're going for. If you know your crop factors and sensor sizes then it's easy to predict your field of view before you set your lens.